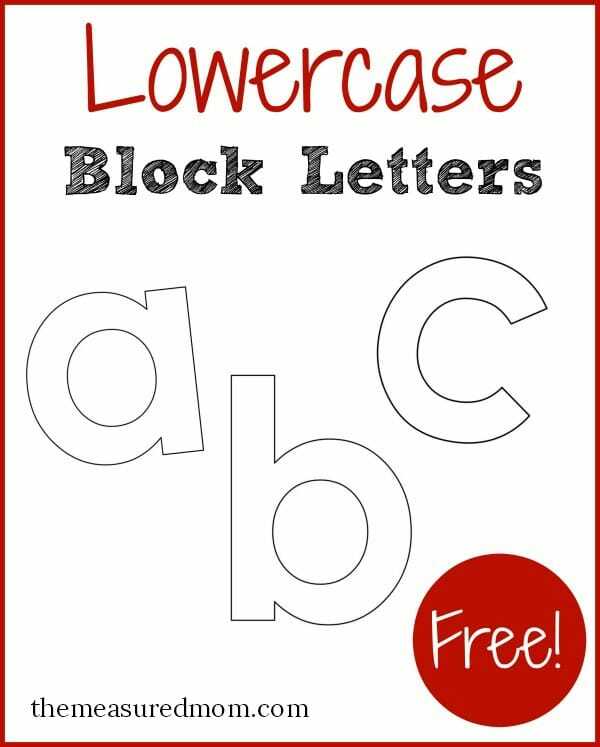 Free printable letters in lowercase! Looking for printable letters? Today I’m sharing an entire lowercase set! Have you seen my set of uppercase block letters? I use them with my preschoolers when introducing new letters and reviewing letter sounds. Today I’m sharing a lowercase set. You can use these in a variety of ways! Print a letter and have your child fill it with objects that start with the letter’s name. 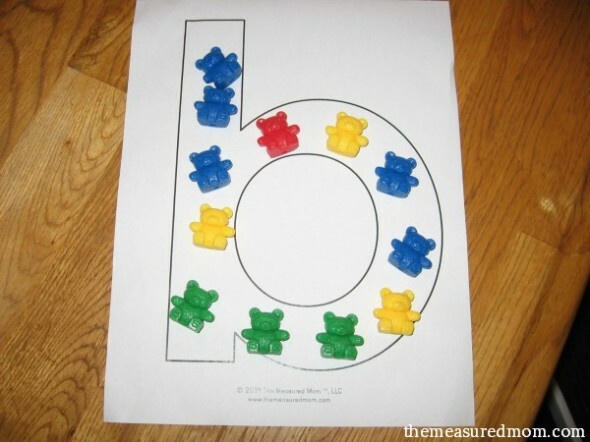 We filled our lowercase b with counting bears. 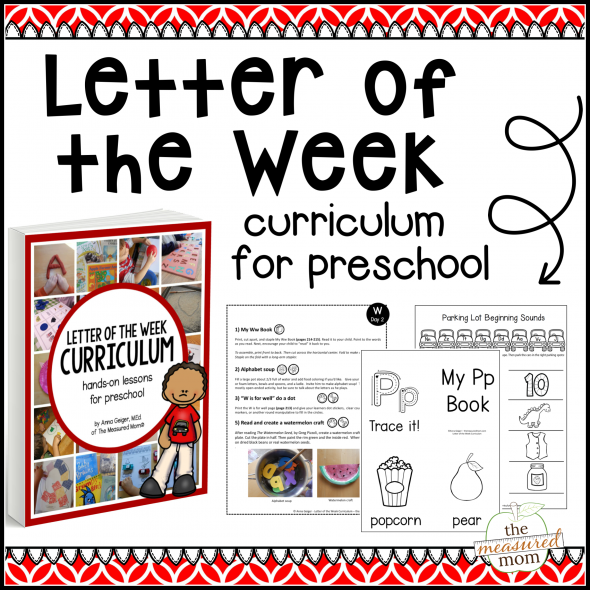 For over 150 ways to fill the letters, see this post. Print the letter twice, once on regular paper and once on construction paper. 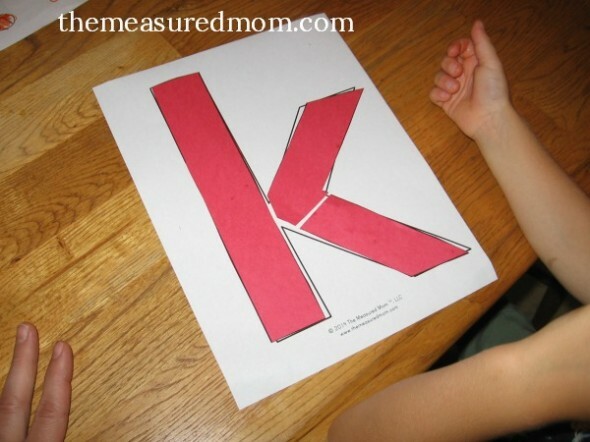 Cut the construction paper letter apart and have your child put the puzzle together. 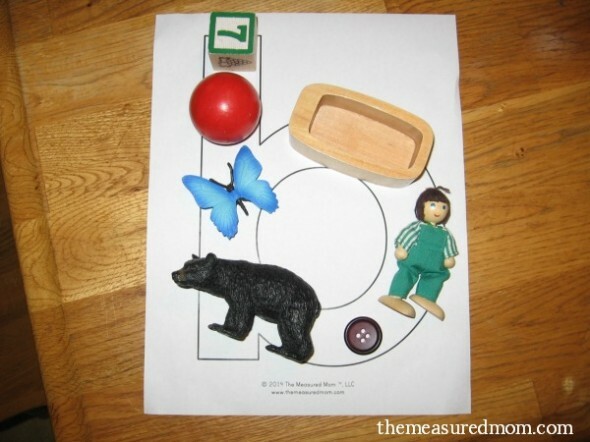 Collect different objects from around the house that start with a certain sound and place them on the letter. You could also cut pictures from magazines, but this is more fun! Use the printable letter as a pattern to create a letter-themed craft. This magnet idea is from the popular craft series at Totally Tots. You’ll find a similar series at The Princess and the Tot. For a more child-centered craft series using lowercase letters, visit No Time for Flashcards. 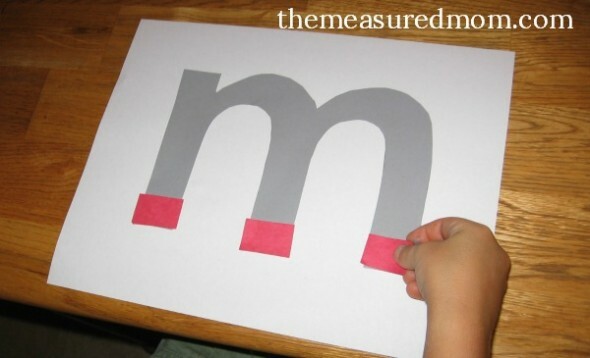 Follow The Measured Mom’s board Alphabet Activities on Pinterest. These are great and so versatile. Just pinned, thanks for sharing! Thanks so much for the pin, Tara! Love this idea. Will try this with my daughter. hi – i think i am being really dense here, but how do download your lower case letters please?? How do I download the printable lowercase block letters? I already tried what you recommend and even like that I cannot do it! What are the things you tried, Diana? You’re very welcome, Noelle – so glad you can use them! You’re very welcome, Margarita! Thank you so much for your kind words! I am in awe of the work you do!! You inspire me with such great new ideas for my class and my daughter at home. You’re very welcome, Ros! I hope you find many helpful resources on my site! Thank you very much. These letters saved my day. First time on your site. I am teaching kindergarten. Really awesome! Love these. Thanks so much. My kids will love them. Can you tell me on page R, what is the word related to the dolphin? Hmmm… this page is just block letters. Are you thinking of a different printable?